Razer, the U.S.-Singapore firm that produces PCs and peripherals for gamers, is set to raise as much as $550 million from its Hong Kong IPO after it revealed its price range. The company first filed to go public in July, and today it confirmed that it plans to offer 1,063,600,000 shares at a range of HK$2.93-HK$4.00, that’s around $0.38-$0.51. If the full allocation sells at that top price then the listing would raise $550 million, at mid-range that’s HK$3.5 billion or $450 million. 12-year-old Razer plans to spend the proceeds on developing new product verticals — it is expected to announce its first mobile device before the end of this year — funding acquisitions and R&D, and also growing its brand via increased marketing initiatives. Three-quarters of revenue comes from the sales of PC accessories like gaming mice, souped up keyboards, specialist headphones and more, but the firm branched into PC devices with the Razer Blade, a high-performance laptop dedicated to portable gaming that costs more than $2,000, and it bought audio visual brand THX in 2016. Despite the price, margins on the Blade are low at under three percent. Razer said in its prospectus that it isn’t likely to be profitable for some time as it is focused on expanding its business. Beyond hardware it is betting that a digital services play can leverage its brand to pay dividends, with its payments platform — funded by another acquisition — representing a critical part of that strategy. It aims to grow its presence in key markets like China, where it claims to be the top gaming accessories brand, and North America, which already accounts for 50 percent of sales. 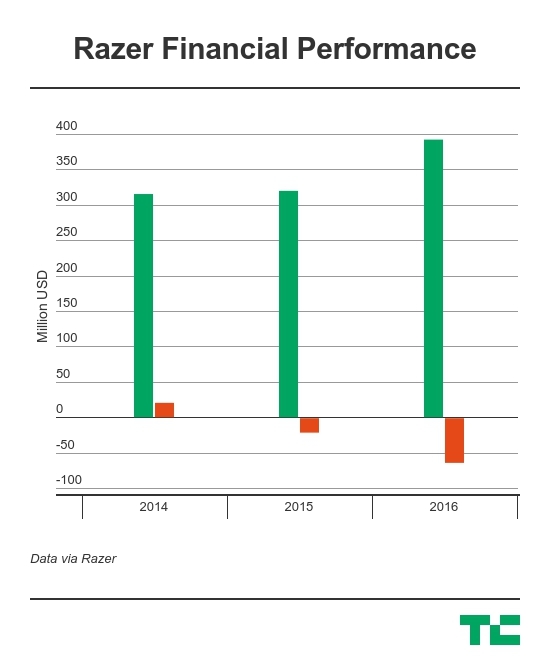 That’s yet to come and Razer can point to being profitable in 2014 — to the tune of $20.3 million — before losses in 2015 and 2016, $20 million and $59.6 million, respectively. The former, it said, was largely down to the cost of an aborted U.S. listing, while its most recent financial year saw an increase in stock options and more R&D. Excluding that compensation, Razer’s loss for 2016 was a more modest $20.6 million. Revenue-wise, Razer is in a tricky spot. Total sales growth hasn’t been amazing, instead the company’s real opportunity is that the global games industry itself will expand to give it more customers to sell to. There’s precious little analysis on the peripherals space but a report commissioned by Razer itself concluded that gaming peripherals were a $2 billion market in 2016. With the base of global gamers predicted to jump from two billion in 2016 to 2.7 billion in 2021, Razer is pitching investors on that opportunity coupled with its forays into mobile, AV, services and payments. Existing backers who have already bought into the vision include Foxconn, Intel, IDC-Accel and Hong Kong’s richest man, Li Ka-shing, who invested via his Redmount Ventures fund. The SCMP reports that they’ll be joined by committed IPO investors Singapore fund GIC, real estate firms Kingkey (China) and Singhaiyi (Singapore), cigarette group Djarum from Indonesia, and Macau-based casino owner Loi Keong Kuong. A tranche of shares for the public will be offered up this week. Alongside Razer, Tencent’s China Publishing Group — an Amazon Kindle-like ebooks business — is also going public in Hong Kong. The HKSE has increased its appetite for tech firms after selfie app make Meitu raised $629 million in a December listing.